At the beginning of April this year I decided to buy a comfortable pair of walking shoes and start walking to and from my office - a five mile round trip trek. 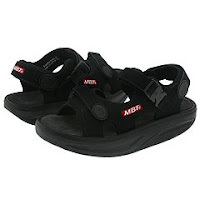 I had heard about MBTs (Massai Barefoot Technology to the uninitiated) over a year ago, but wondered how good they could possibly be for over $200. Now, I had heard claims of everthing from weight loss and anti-cellulite powers to back and joint mending miracles, but I was skepticle. So I tried a pair on. I walked around the store for a good half hour and had to admit, they started to feel pretty cushy. So I took the plunge. So in my eyes, a shoe that makes me love walking, gets me to engage in healthier activities, saves me money and reduces my carbon footprint... is a true shoe miracle. I run for 20 mins on the treadmill everyday and for the past 2 weeks ever since it got cold my knees hurt a lot when I run.I'm 23 so wondering what is wrong.